Seattle ’s St. Patrick’s Day parade dates back to 1971 . For a complete history of the parade, click here. 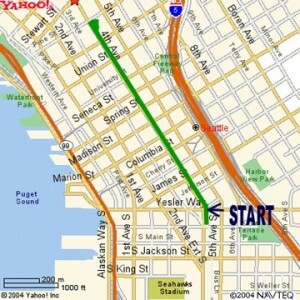 The Parade route starts on 4th Ave at Jefferson St. and ends at Westlake Park (on 4th Ave at Pine). The Parade will travel from 4th Ave at James St, downtown Seattle, up 4th Avenue, traveling north from Jefferson to the reviewing stand at Westlake Park. From there participants are invited to travel for free via the Monorail to the Seattle Center for closing ceremonies at the Irish Festival in the Armory at 2:30 pm. Seattle celebrates St Patrick's Day in grand style, with a full week of activities. Festivities kick off with the proclamation of Irish Week.Seattle, WashingtonDue to Seattle's northern state climates, like Ireland, the city received many Irish immigrants. So many that Seattle and Galway are sister cities. Every year on St. Patrick's Day, there's a mini-parade to prepare the parade route with the ceremonial painting of a green stripe down the center of 4th Avenue. The day of the parade begins with a Catholic Mass for peace. The Seattle Parade starts at 4th Avenue and Jefferson to the Reviewing Stand at Westlake Park, ending officially at the Seattle Center. The annual Irish Week Festival is enormous, including Irish step dancing, food, historical and modern exhibitions, and Irish lessons. This is all celebrated on March 14. And may be carried on till the 15, 16, and 17 of March.